At Foundation Supportworks by Woods, we pride ourselves in being foundation repair experts. We have built our reputation on unparalleled customer service. Our years of experience, industry knowledge and specialized training are devoted to help our customers protect their home or commercial building from foundation issues. As members of the Supportworks international network of foundation repair contractors, our experience isn't limited to a few states, or even the United States. Each member of Supportworks benefits from the collected experience and knowledge of best practices that have been gathered from all across the United States & Canada, from coast to coast. 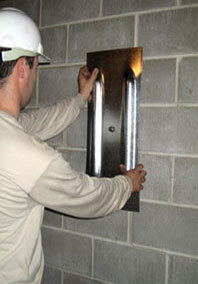 Such familiarity gives us the leading edge in dealing with all of your foundation issues and needs. With Foundation Supportworks by Woods, even the most complex structural repairs and designs can be handled with ease. At Foundation Supportworks by Woods, we're committed to fast, friendly, and reliable service. Our customers have appreciated our punctual, organized, and professional work. We are determined to be there for your structural and foundation repair needs . From structural moving and lifting, to the installation and repair of retaining walls, pin piles and helical piers, Foundation Supportworks by Woods is ready to help. Contact us today for your Free Estimate for foundation repair!